Landscape design, installation & maintenance contractor serving Joliet, Plainfield, Oswego, Yorkville, Shorewood, Minooka, Romeoville, Frankfort, Orland Park, Tinley Park, Mokena, Lockport, Elwood, New Lenox, Wilmington, Manhattan, Homer Glen, Burridge, Lemont and nearby towns. 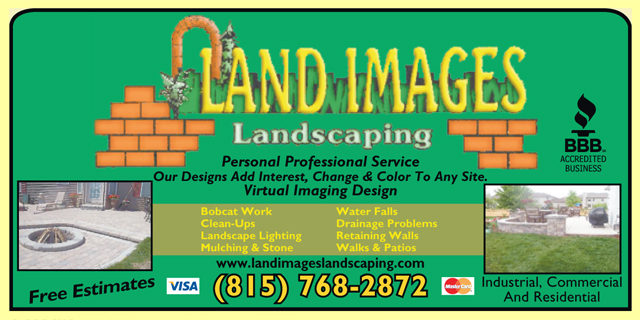 New landscapes, Relandscape, Trees, Shrubs, Perennials, O. grasses Mulch, Decorative stone, Top soil, Patios, Retaining walls, Drainage problems, Lawn Maintenance, Mowing, Aerating, Dethatching, Fertilizing, Fall and Spring Clean up. Call us (815( 726-3146. Click on thumbnail to see our ad in YellowBook.